Rice is the most important food crop, both worldwide and for China. To achieve a transition towards sustainable rice production based on agroecology, biodiversity is a crucial component. Through China’s long history of agricultural development, many rich experiences of harnessing biodiversity in traditional rice production have been accumulated. This agricultural heritage is complemented by new experiences developed over the past 30 years, associated with agroecology, ecological agriculture or eco-agriculture as it is variously termed in China. 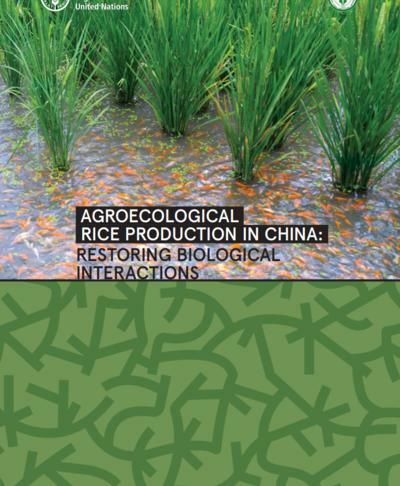 Eight typical methods of agroecological rice production are introduced in this report, with an emphasis on the role of biodiversity in this production. The first method is based on the genetic diversity of rice. The second to seventh methods each emphasize diversity at the species level. The second method involves intercropping rice with lotus. The third and fourth methods involve the use of green manure in rice fields. The fifth, sixth and seventh methods are based on the co-culture of rice with ducks, fish or frogs in paddy fields. The eighth method is based on the use of biodiversity in rice production at the watershed scale.